This server has received 2229184 hits from both ipv4 and ipv6. TomcatCon London is the place for all users of Tomcat to expand their Tomcat knowledge in areas such as networking, security, performance and deployment. It also offers an opportunity to discuss the current Tomcat roadmap and help inform future development. 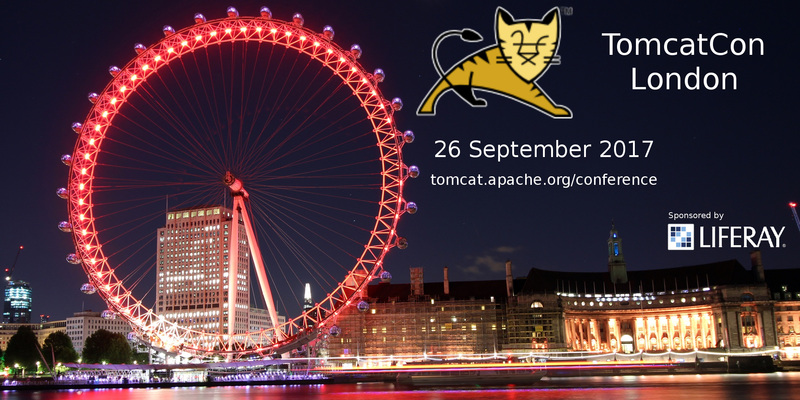 Registration for TomcatCon London is now open. The Apache Tomcat team announced that support for Apache Tomcat 5.5.x ended on 30 September 2012. The final release was 5.5.36 on 10 Oct 2012 and is, and will always remain, available from the archives. Customers using Tomcat 5.5 should especially note that security updates are NOT being produced for Tomcat 5.5 any more. Therefore they should consider migrating to Tomcat 6 or later as soon as possible.